Anastasia Again! by Lois Lowry. An Anistasia Krupnik Book. Review: Have you ever wondered how moving to the suburbs would be? Have you ever been nervous to be in a new place? Well, Anastasia did. In Anastasia Again by Lois Lowry, Anastasia doesn't want to move to the suburbs. She tries so hard to convince her parents not to move, but it doesn't work. 12-year-old Anastasia Krupnik thinks that moving to the suburbs is going to be horrendous. She tries to convince her parents with assumptions of the suburbs that sound terrible. Anastasia also gets her little brother mad. To make Anastasia cheer up a little about the suburbs, they let her pick what should be in the house. She knows, if she gave answers that are unbelievable they would never move. So she asks for a tower in her room. She thinks that will never happen. Will Anastasia be able to convince her parents to stay where they are? You'll have to read to find out. Anastasia Again teaches a lesson. You should never make assumptions about something you don't know. Anastasia makes assumptions about the suburbs, but finds out her assumptions aren't always correct. She is also nervous of moving in a new place because she is used to living in the city. 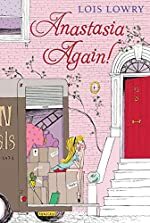 Although Anastasia Again is about a girl, this book is actually focusing on how she is having a hard time about moving. Anastasia Again is for ages 10-13 because Anastasia is that age, and anyone could relate to her if you have ever moved before. I recommend this book because if you are like Anastasia and you have to move, you would know what to do. Also Anastasia Again teaches a good life lesson about making a judgment. I recommend you read this book because it is very helpful. She faces the same problems you might face today. You should read Anastasia Again by Lois Lowry today! Review written by Devanshi (6th grade student). We would like to thank Houghton Mifflin Harcourt for providing a copy of Anastasia Again! for this review. Have you read Anastasia Again!? How would you rate it?